For decades, humanity looked at the common baseball hat and just saw a thing you put on your head. It took a special kind of person to look at it and think, "I could attach beer cans to the sides of that thing so I'll have my hands free to hold two additional beers." It took a special kind of person to look at a t-shirt and realize, "I could draw a tuxedo on that t-shirt and trick people into thinking I'm wearing a tuxedo." Who were these people? Drunk idiots, mostly. But also visionaries. And now we're giving the Team Fortress 2 community the chance to join that pantheon. How? By submitting your t-shirt and poster designs to be voted on by the Team Fortress 2 community. 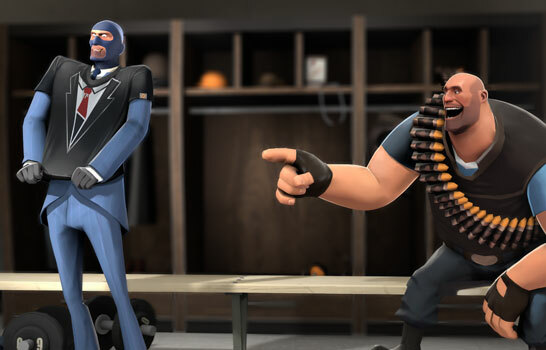 Simply navigate to the ‘Merchandise” tab in the Team Fortress 2 Workshop.